I took the weekend off from fully following Marie Kondō’s advice on my tidying journey. I was struggling picking the right category of things to give the full KonMari treatment, but I knew I had a whole lot of junk that spanned multiple categories that just needed to be tossed. I filled two of the trash cans (the big kind you sit next to the road for the trash man to pick up) over the course of Saturday’s junk-tossing marathon. While I love Marie Kondō’s system and have been following it step by step, I felt like I needed to get a bunch of crap out of the way so that I could move forward. I had old, broken planter pots. Plastic totes that were cracked down the side. And, all sorts of other oddball things that were past their days of usefulness. I didn’t think it best to hold each of these items to see if they sparked joy. They simply needed to be thrown away. It was a liberating activity because now I feel like I can better see some of the areas that I can focus on next. On Sunday, I started this year’s gardening efforts. I plan to cut way back this year with the garden so that I can focus on other goals. I pruned the peach and plum trees. Truth be told, I’m a little late on this. We seem to be getting an early Spring. One of my peach trees is already blooming, which may not be a good thing. Last year, the same thing happened, but a late frost killed all of the blooms. With any luck, I’ll get to eat a few fresh peaches and plums right off the front porch. I also planted out a small bed of red potatoes. This is separate from the main garden. 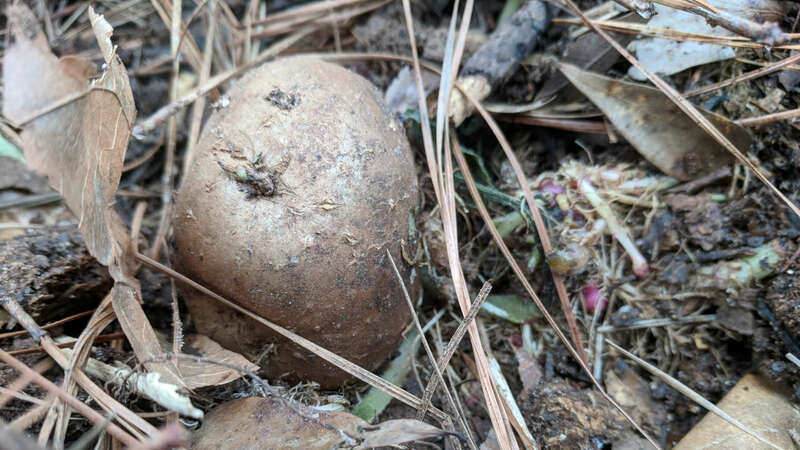 I had a lot of potatoes left over from last year’s garden that were already rooting out on a table and producing baby tubers. I figured I might as well go ahead and stick them in some soil somewhere. I planted about half a 5-gallon bucket, but there’s at least 3 times that many left to plant from last year’s crop. I could’ve finished the afternoon with some more tidying, but I got a bit tired. After a few months of little-to-light labor, my muscles were a bit unprepared for the work I put them through.